We had a lot of fun during this Cleveland Soul Sunday Hosted by Stone the Butcher and Suave Goddi. The Revolution Brass Band was Awesome. This was recorded with SM 57’s collecting the ambient brass and Suave Goddi’s vocal . Kuddi’s tuba was going directly into the focusrite 8 channel location recorder into protools. The drummer provided his own kick mic. The video was recorded with a GoPro Hero. The L/R Monitor outputs of the Focusrites are being sent to the house PA 3&4 channel inputs and pumped out 2JBLs and subs. We plan to record an original collaboration in the SSL in a few days. Cleveland Soul Album 2017 Auditions are held at the Kultivation Theater on Sundays from 8pm-9pm. How many yo-yo tricks do you see? I want to thank everyone that danced freely in the streets of Cleveland! 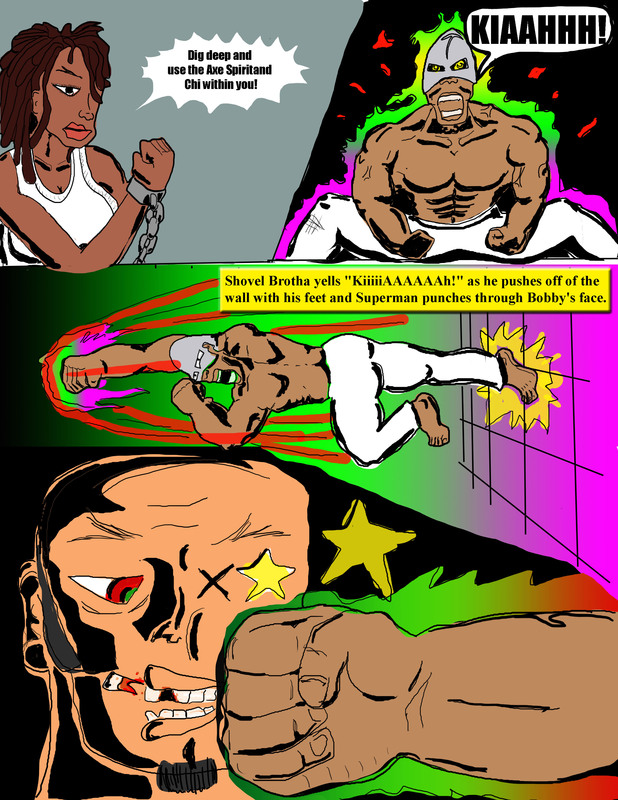 Shovel Brotha Pg13 (Advanced Preview) Superman Punch! On this day I really wanted to get reacquainted with the SSL Studio. I also wanted to get started with collecting some drum samples. So I go and check out the following mics: a NU87, two MXL2010’s, two Octava pencil mics, two SM57’s, and a D112. I feel I’m going to have enough time to record a song too, so I also checked out a Gibson bass guitar, a Yamaha steel-string acoustic guitar, and Les Paul electric guitar. After a few hours of getting re-acquainted with the SSL my drums are patched into mic inputs 25-32; and I have a 2 X 1 rectangular Gobo booth with a U87 set up at lip height with me. Pro tools is set up, and my cue send is going to the Aviom. Now I’m ready to record my drum samples. The D112 receiver is placed in the sound hole about 2 inches facing the beater. The MXL2010 was placed at a 45deg angle with diaphragm pointing at drum head about 6 inches away. The SM57 is on the snare with diaphragm pointed at the drum head at 45deg angle about 3 inches away from drum head. Another SM57 is placed the same way as on the snare at the rack tom drum head. The hi-hat is being miked with an Octava and the diaphragm is pointing into the Hi hat cymbals about 2” away from the opening of the hats. I hit record enable in the control room on all of the Pro tools drum tracks and then I hit record on the SSL and walk into the studio. I record the Kick first. I stomp the beater at various velocities for some variation in sound. I do the same with all of the other drums, also applying mutes on the crash, and various rolls on the snares and toms. I plan to do drum replacement on the majority of the songs this year. Later I can input the drum samples into my Akai. Luckily I still have time to record a song. I go into my Gobo booth with my two MXL 2010’s and set the up in Blumlein formation pointed at the vanilla point of the Yamaha acoustic guitar. Blumlein setup is 4 feet from the short wall of the Gobo booth. So I set my tempo in protools to 98bpm with tap tempo. I listen to the tempo and see if it is not going to drift into being too slow or fast while performing the song. I then record enable the guitar tracks I walk into the booth and start playing. It took about 4 takes to get some guitar I was happy with. The song I was playing is an acoustic version of Mesa Boogie. I listened to the guitar and I liked it. So I then proceeded to record vocals for Mesa Boogie on the NU87. I got in a few takes and then I compped the vocals and then my time was up. I felt it was a Thursday well spent. After returning home to his backyard Carl knew that something had to be done. The Angels were speaking. It would be blaspheme to not do something. He took the shovel and he dug into the neighborhood with all his heart. His arms became dislocated from all of the shoveling. In his pain he thought of all of those who were in pain under the will of fiendish people. Then there was a vision accompanied by a scream that invaded his mind. Instantly the shovel fused to his hand and yanked his dislocated shoulders back into place while pulling him straight up into the air high above the city. The vision of Saint Peter flew in front of him comforting him. Inspiring him. The blade of the shovel fused to Carl’s face as if it were a mask. The Angel of Metal consumed and guided him in a blitz of fire through the air and down at an angle straight through a lawn and dirt into a cemented basement. 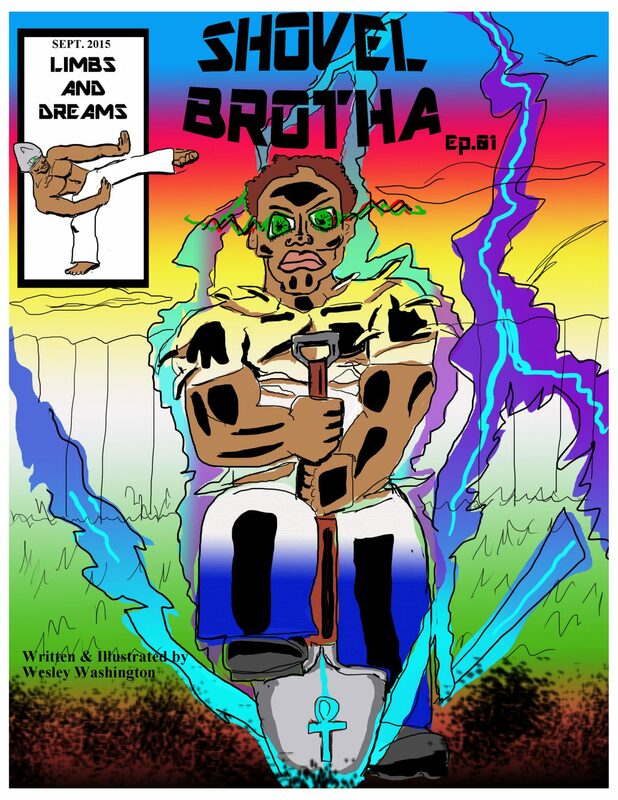 After the dust and dirt and cement cleared he saw a beautiful twenty-something yr. old brown skinned woman with curly hair. She was barely clothed, and very thin. she may be confused: instead there was a certain light in her eyes. She knew this was going to happen somehow. She knew someone would be coming for her. She was riding faith. Her body and spirit were resonating with the tone of the Angels, as the Saints consoled Her.